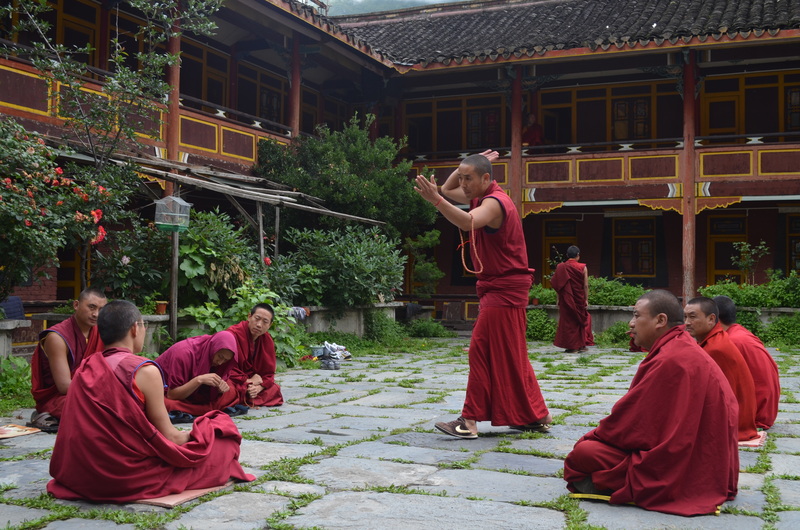 Tibetan Buddhist monks practicing debate at Nanwu Temple 南無寺, Kangding, China, c. 2011. Photo Peter Romaskiewicz. While taking a graduate seminar a few years ago with José Cabezón, he had the all students engage in a practice which he claimed was standard operating procedure for Tibetan Buddhist monks in training. At the start of each class one student was responsible for reciting in summary the important points of the previous class. [An outline of a similar process can be found here.] We were not allowed to look at our notes nor we we allowed to make crib sheets. Individually, it was an exercise of memorization, but it was also an exercise of analysis and application. Collectively, it allowed the class to all be on the same page, preparing us all for the materials to be covered that day. It also sometime elicited clarifying questions. From what I remember, these daily summaries would last 5-10 minutes, followed potentially by conversation. Every once and I while I like to do something similar with my class, and after I fell behind in lecture last week, today was a great day to break this exercise out. I wanted to to do a group activity at the start of class (I find it harder to break the class into groups halfway into lecture) and this seemed promising. I often just ask one student to summarize from memory for the whole class, but here I wanted the class to socialize a bit more and converse with each other. I asked the groups to come up with three important points I touched on in lecture the previous class (here, on the Bhagavad Gītā). This primed the students to the topic that I revisited today and also allowed them to hash out any confusions among themselves. Overall, I found this to be quite valuable. It allowed the students to socialize, interact with (and teach) one another, and test their memory – or at least to familiarize themselves with their notes. I suppose this could be done for each class (maybe even making it a regular assignment), but I would have to take the time into consideration. The group work only lasted 5 minutes, but the class discussion lasted another 15 (there were a handful of questions).